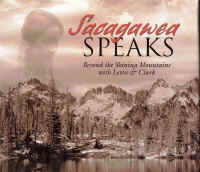 Description: Sacagawea Speaks is filled with classic storytelling and user-friendly history that leaps off the page and into the imagination. Here, Sacagawea tells readers of her extraordinary life with the Corps of Discovery. Author Joyce Badgley Hunsaker elegantly combines oral traditions, scholarly research, historical anecdotes, and images from a multitude of collections to present to readers the first complete picture of Sacagawea --the woman of the Lewis and Clark Expedition. Rounding out the first-person narrative and exquisite selection of color, historical, scenic, and expedition artifact photos, readers will find Shoshoni vocabulary, quotes from the journals of Lewis and Clark, interpretive notes, a timeline, and more.